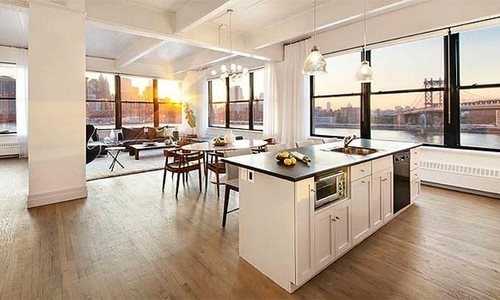 Hollywood actress Anne Hathaway has sold her lavish Brooklyn condo after only having purchased it 18 months ago. The Devil Wears Prada and Les Miserables star originally purchased the home with husband Adam Shulman for $US4.1 million early last year. However, the couple used the space as a walk-in-closet and were reported to have lived elsewhere as Hathaway believed that the windows in the apartment on level nine of the DUMO Clock tower building left her too exposed to the public. With an asking price of $US4.25 million the luxurious 3-bedroom apartment that overlooks the Brooklyn Bridge and Manhattan skyline has finally sold after it was previously taken off the market due to a lack of interest. The condo offers high ceilings, hardwood floors, a newly renovated study, three large bedrooms, and the building comes with its own, concierge, gym and communal rooftop. Each of the spacious bedrooms features marble en-suites and spectacular views of the Manhattan Island skyline. Allegedly insiders told the New York Post that Hathaway believed that she was too high profile and too easily recognised to be living amongst the hustle and bustle in Manhattan. Accordingly the Oscar-winning star and her husband lived in another apartment in the same century old building which was obviously more secluded. The property was listed by Warburg Realty. Erin Lyons is a writer and editor with a Bachelor degree in Journalism. She has a strong interest in the music and travel industries and hopes to one day work overseas writing for a popular magazine. She has also contributed to publications such as Upstart Magazine and lifestyle and photography website Adamnoteve.